The excellent cricket museum at the Basin Reserve in Wellington celebrates New Zealand’s proud cricket history very well. One of the displays is a selection of “New Zealand’s greatest ever XI” - from the present team only, and rightly, Daniel Vettori makes the team although Stephen Fleming must have been a near miss. Should the Kiwis repeat this exercise in five or so year’s time I suspect that one more of the current team will be firmly in the frame. Ross Taylor, playing in only his fourth Test match, looks a truly outstanding prospect. Taylor had a faltering start to Test cricket last November in South Africa where he failed to impress – he was subsequently left out of the Kiwi team for the one-sided home Bangladesh series. Recalled for the First Test against England in Hamilton Taylor scored a fine century – and he has now followed this with a fifty in each innings in the Second Test at Wellington. 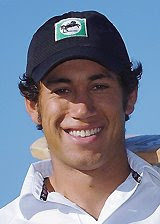 Ross Taylor, at only 24 years of age, lacks First Class cricket experience – he has played only 67 First Class innings – although he has already played 38 One Day Internationals. Given this imbalance it was perhaps not surprising that, at Wellington, he seemed to lose concentration in both innings once he reached his half-century and almost immediately got out. Nevertheless he is a player with all the shots – including the defensive ones - and it will be a surprise if he does not succeed in all forms of the game. Ambrose was excellent. I enjoyed his innings from the top of the Museum stand - great view! 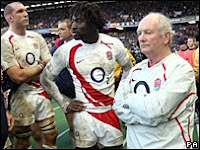 But he did have his luck - perhaps a dozen plays and misses that Bell or Strauss might have nicked! Fortune favours the brave and Ambrose was certainly brave - run a ball for a while. Colly looked good in a supporting role - what a battler he is. I may be wrong (not for the first time) but 350 looks a potentially winning score if they can get there. Notice anything about the photo of Casey Stoner celebrating his win in the Moto GP in Qatar last weekend? No not the young man’s charming smile – it’s the logo visibly splattered on his overalls I mean. Marlboro if I’m not mistaken. A fag brand. Promoted by a fine young athlete to the young man’s world of motorcycle racing. Glamorous Ha? So as the young men and not a few young women as well, revel in the success of the young Aussie I bet just a few might be inclined to reach for their Marlboro’s next time they want a gasper. I’m sure Philip Morris hopes the same – otherwise why would they sponsor Ducati and Stoner? But isn’t it time that the world of motorcycle sport caught up with the more civilised sporting world and banned the impropriety of tobacco giant sponsorship of their sport. And shouldn’t the clean- living young Stoner turn down the tobacco shilling as well? Whilst I was chilled and a bit damp in the North stand at Murrayfield watching England’s abysmal attempt to overcome Scotland in the Calcutta Cup match our cricketers were shaking in their beds at the thought of having to face the might of New Zealand on the final day at Hamilton. What is it that makes England sporting teams so incapable of playing to their real abilities time and time again? A failing in national character? A lack of confidence when push comes to shove? Coaches who think that solutions are technical not in the mind? A total lack of self belief? At least the rugby players did try – they were just to afeared to be up to the task against an opposition team that hitherto was the worst in the 6 Nations. The cricketers really made no effort to take on (and I mean take on) the Kiwis who by any standards are not great shakes (the excellent Vettori excepted). Does Vaughany really think that scoring 199 runs in a whole days play is what Test cricket is about? Has he forgotten Edgbaston 2005? And what about the overpaid backroom staff? There’s a couch there for everything – even bottom wiping I would think (though not drinking – here we lead the world). Hoggy and Harmy just don't bowl enough. Burn out? Don't make me laugh. By Napier (when England could well be two down) they could have just about got in the groove. Pick the best squad (and the same squad) for all forms of the game. Don't allow a player to pick and choose between Tests, ODIs and Twenty20. If you can play you can play in any form of cricket. Get rid of the phoney One Day and/or Test specialists. Get the selfish counties to stop loading their sides with non England qualfied players. How the hell can the Harmison's of this world improve if they are not challenged constantly by potential internatonal players from around the counties. Play more not less. In 1953 Alec Bedser bowled 1253 First Class overs. In his whole eleven year First Class career Steve Harmison has bowled less than 5000 0vers in total. Back to the glory days? 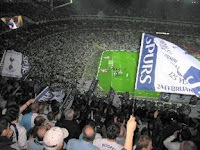 Tottenham Hotspur’s stirring victory in last Saturday’s Carling Cup final has understandably prompted the Spurs faithful to wonder if, at last, the glory days are returning. There are too many false dawns in sport and caution would seem to be prudent – but this knarled old Tottenham fan is happy to suspend the doubts for a moment and hope that this time, indeed, we might just have grounds for hope. The reality check first. The “League Cup”, as it was always known before the sponsors hijacked the name, has always been the least of the English domestic competitions. For the last few years the top three clubs (you know who they are) have used the cup as a sort of youth tournament playing their younger players through most of the rounds. Arsenal and Chelsea reached the final last year doing just that – and entertaining stuff it was as well. But in the 2008 final there were no gifts or favours – Chelsea were there to win as much as Tottenham and their star-studded side fought hard, but were beaten by a better side on the day. What a delight it is to write those words! Since Juande Ramos took over as Spurs Manager they have lost only five of their 28 games and there has been a remarkable improvement in all aspects of the team’s performance. The most significant change has been in respect of the players’ fitness. Under Martin Jol earlier in the season some of the players looked as if they had been rather too regularly eating at the same generous trough as the Dutchman. The talented young midfielder Tom Huddlestone especially bulked up rather too much – and it wasn’t just puppy fat. But under Ramos there has been a huge change and Huddlestone and the others now look properly match fit and as a consequence they are quicker and decidedly more focused as well. In truth it was pretty scandalous that some players who earned the equivalent of well over a million dollars a year ran out of puff towards the end of the match (Huddlestone was one) – but Ramos has put a stop to all that. There is always a tinge of nostalgia at a football club with, it seems, the ghosts of the past shimmering silently behind every pillar. I first went to White Hart Lane back in the 1950s and although the old ground has changed a lot it is still recognisable as the same place that Danny Blanchflower and Jimmy Greaves and Bobby Smith and the rest graced in those distant days. It is hard to put a finger on quite why there is something just that bit different about Tottenham Hotspur, but the memories of distant days at the Lane is part of the reason. To be fair it was the same for that other north London club at Highbury and whilst their new home at the Emirates Stadium is splendid in every way would I really want Spurs to follow the Gunners’ example and move to a grand new home? Maybe I would – you have to have ambition, but if the Lane could somehow be magicked into a 60,000 seater ground that would be ideal! I have many friends who have Spurs as their “second club”, if not their first. It’s a strange phenomenon but unless you are a supporter of another London club it is not uncommon to have a soft spot for “the Tottenham”. Even Manchester United fans – especially the older ones - tell me that they have always enjoyed the Spurs style of play. It comes originally from the great “push and run” team which, under Arthur Rowe, made Spurs champions back in 1951. The double winning side of 1960-61 had a similar style scoring 136 goals in 49 matches in that amazing season. But that was Tottenham’s last top flight league success, and although there have been some splendid wins in the cups, the Spurs fan really hankers for a Premiership trophy above all. But for now we are happy that the silverware cabinet has something in it again at last! The Tottenham board have impressed me in recent years under their smart Chairman Daniel Levy. Levy doesn’t quite fit the traditional stereotype of a Football Club chairman – he is a Cambridge University graduate for a start. But he is fiercely ambitious and has a ruthless streak – as we saw with the sacking of Martin Jol. The basics now look to be right at White Hart Lane – strong finances, a good playing squad and an excellent Manager. And the fans are special as well. Every sports team has its loyal fan base that sticks with the team through thick and thin and Tottenham is no exception. But there is a quirky difference about the boys from the Lane which comes from their collective anarchic sense of humour. Mind you at times if you didn’t laugh you would cry, but maybe, just maybe, the smiles will be for the right reasons from now on! Come on you Spurs!